Working at the ice cream parlor, gas station or local restaurant for the summer is a rite of passage for many teenagers. But finding summer work can be challenging for young people with disabilities, who may be faced with special needs for transportation, or physical and communications skills. Nationally, the unemployment rate for adults with disabilities is from 60 to 70 percent. A six-week summer work program at Intermediate School District 287 in Plymouth, Minnesota trained 26 students with disabilities in document imaging tasks, and was so successful that the district has decided to make it a regular part of its training opportunities starting this fall. The scanning work is exacting, repetitive, clearly defined, and requires little social contact. These features make document imaging a good fit for many individuals with an Autism Spectrum Disorder (ASD), which covers two-thirds of the students participating. The district is exploring an educational certificate for the document imaging employment program as a way to assure employers that the individuals have attained some competency in imaging. The work experience program is the summer extension of Attain, the district’s school year transition program that prepares youth with developmental disabilities, ages 14 to 21, for employment. Students are paid minimum wage through federal funds for summer youth employment. Students, who were referred by their home district for the program, have come from 20 different school districts located throughout a seven-county area. 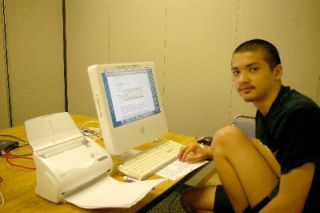 Along with their specific training for computer equipment use, scanning and uploading files, the young people also learn the critical nature of the material they will handle and the strict requirements for confidentiality - which include signing a confidentiality agreement. Aaron, who has autism, worked directly in the finance area and used a large capacity, high speed scanner to upload check stubs and receipts, which could exceed 100 pages for a single stub. After only one day of training, he began organizing the imaging area for maximum efficiency, working quickly and silently and with complete accuracy. The job fit well with his preference for minimal interaction with others and no social conversations. Scanned worksheets for the elementary-age students lacking fine motor skills help students gain confidence as they learn, independent of direct staff support. “The end products are invaluable resources for students and teachers and the projects provide valuable skills and a sense of satisfaction to the students producing them,” said Sandy Tufte, a physical health and disabilities teacher. At another post in the vision materials production area, students scanned educational worksheets to Braille which, in turn, makes them accessible by screen readers. This allows visually impaired students to work on class material at the same time as the rest of the class. Over 30 books, totaling over 4,000 printed pages, have been scanned. Supervisors of each department report that after a brief training, the students were ready to set up their workstations and start scanning operations. One student, Ryan, needed only an hour of training to begin uploading scanned files directly to the server for permanent data storage. He appreciated the challenge and variety of the work and that the tasks did not depend on a great deal of social interactions. Ryan’s supervisors were impressed with his accuracy and thoroughness. The focus on document imaging was encouraged by a statewide emphasis on employment in document imaging begun by the Minnesota Governor’s Council on Developmental Disabilities in 2002. “It is very encouraging to see document imaging skills taught in educational programs so that young people with disabilities might obtain rewarding and good paying jobs in the future,” said Colleen Wieck, executive director of the Council. In 20 locations around the state, day training programs seek to find work for those with disabilities in document preparation, scanning and indexing for legal, business, medical and government records. Intermediate School District 287, one of only three intermediate school districts in the state, serves approximately 10,000 students in the areas of special education, gifted education, area learning centers and career technology programs.